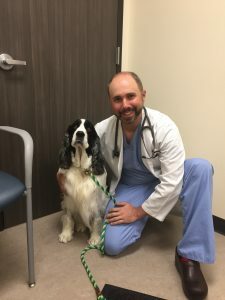 “I just wanted to reach out to you to let you know what a wonderful experience we had at Upstate Veterinary Specialties. Two weeks ago, today, at 5:15 in the evening our nine-year-old male English Springer Spaniel named Guinness started to exhibit symptoms of bloat. We feared that it could be much worse and drove up the Northway at rush hour to UVS. The trip usually takes a leisurely 15 minutes but, on that day, it was over 45 minutes. Guinness was in extreme distress. He was panting, crying and trying to vomit, but was unable to do so. His eyes were rolling back in his head and his gums were turning white. My husband and I rushed him in and he was immediately taken for an X-ray. He presented with a twisted stomach. Luckily, Dr. Palamara had not left the building yet. He stayed and performed surgery on Guinness, which saved his life. He had some complications after surgery, requiring a blood transfusion and heart medications. Dr. Palamara did such an excellent job managing Guinness and his scared parents!! He explained everything that had been done and what we could expect. We were able to visit Guinness twice during his stay and the staff took wonderful care of him. They were so patient with Guinness and us on what proved to be a very busy weekend and the hospital. We brought Guinness home on Sunday. He steadily improved every day and by one week post his surgery, I truly felt that we had our old Guinness back! Today was his two week check and everything looks good. He can even discontinue his heart medication. We are so grateful to Dr. Palamara and the entire staff at UVS for being there when we needed them!” – Janet and Mike M.